Jazz violinists arent exactly a dime a dozen. Though Jean-Luc Ponty and Stephane Grappelli come to mind right away, most casual fans would be hard-pressed to name another. 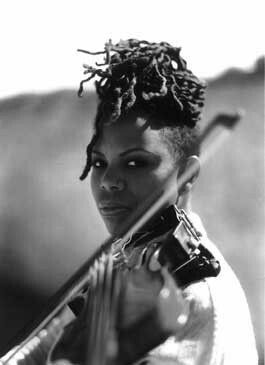 Enter Regina Carter, jazz violins hottest practitioner since Ponty broke out from the pack in the 60s. The nose-ring-sporting Grammy nominee has picture-perfect posture, astounding technique and a warm, thick tone. The audience at her Discover Jazz Festival show this Saturday will find that shes also charming, charismatic and friendly. The Detroit native began classical studies when she was 4 and didnt hear jazz violin until she hit her teens. Her jazz exposure was initially limited to the electronic fusion sounds of Ponty and the soulful urban tones of Noel Pointer. Carter absorbed their styles and transcribed their solos, but was still more focused on classical music. Then she attended a concert by Grappelli. Carter double-majored in jazz and classical studies at the New England Conservatory for two years before moving back to Detroit to attend Oakland University. She also absorbed everything she could from local jazz pillars Marcus Belgrave and Lyman Woodard. In 1987, Carter joined the highly touted all-female jazz quintet Straight Ahead  a Motor Citybased unit that covered mostly mainstream jazz material. Carter earned a reputation as one of the groups standout soloists. She appeared on two albums, Look Straight Ahead (1992) and Body and Soul (1993), which were well received  though the group was generally considered better live. Carter moved to New York City in 1991 and for a couple of years played with the avant-garde String Trio of New York. There, she expanded her musical palette through studio work and exposure to a variety of musical styles, from jazz to hip-hop to country. By the mid-90s, her resume listed gigs with such artists as Faith Evans, Mary J. Blige, Wynton Marsalis Jazz at Lincoln Center Orchestra and Oliver Lake. Her violin can also be heard on the Ken Burns Civil War series. After leaving Straight Ahead in 1994, Carter embarked on a solo career. She released her self-titled debut disc the next year, followed by Something for Grace in 97. Both albums, released on Atlantic Records, featured a combination of straightforward contemporary jazz and r&b/pop-influenced tracks. Because Carter used electronic instruments, many jazz purists  often called the jazz police  called the discs smooth and refused to give her a second look. While some critics scoffed at Carters decision to approach her urban roots, the albums sold well and her concerts earned rave reviews. When she was between recording contracts in 1998, Carter performed consistently. When Carter hooked up with Verve in 1999, the respected record label gave her third album, Rhythms of the Heart, the type of promotional push usually reserved for established jazz heavyweights. It paid off, making Carter one of those overnight success stories. Rhythms was more straight-ahead and acoustic than Carters previous outings, and soon she was the darling of the critics. By jazz standards, Rhythms was also a major commercial success, selling more than 30,000 units. In 2000, Carter followed up with Motor City Moments, a tribute to the music she heard growing up in Detroit, featuring compositions from hometown jazz legends Milt Jackson and Thad Jones and Motown faves Marvin Gaye and Stevie Wonder. Carter swings hard, playing the blues with conviction and the ballads with tenderness, and jazzing up the r&b classics. Motor City also broke the 30,000 mark and solidified her status as one of jazzs hottest commodities. Carters 2002 Grammy nomination was for Best Instrumental Jazz Solo on Fragile, from her collaborative Freefall CD with pianist Kenny Barron. Next month, Carter will go into the studio and change pace once again. This time shell mine her oldest musical roots  classical. Carter has received permission to use Paganinis Cannon violin on some of the pieces. The Guarneri model, famous for its dark sound and amazing projection, was once owned by the 19th-century virtuoso. The instrument is controlled by the city of Genova, Italy, and is infrequently played. Last December, Carter became the first jazz musician, and the first African-American to do so. Festival International de Jazz de Montréal Begins!